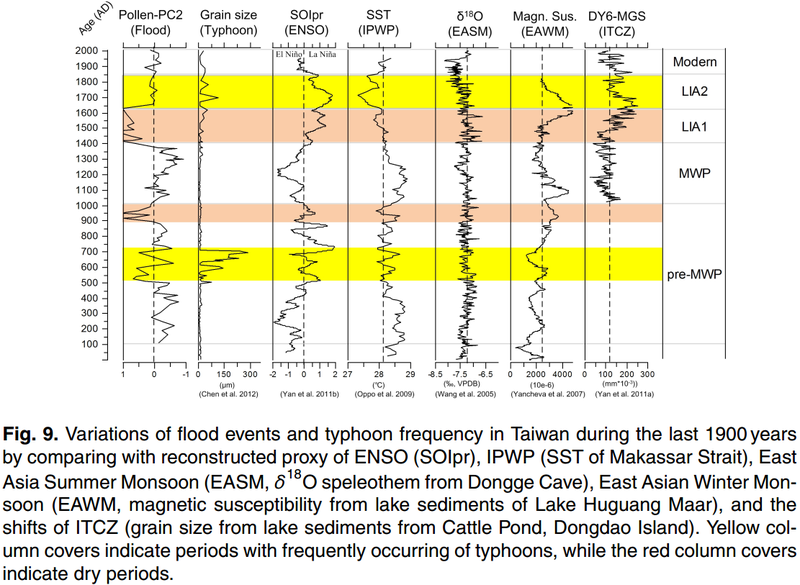 A paper under review for Climate of the Past reconstructs Taiwan climate over the past 1900 years and finds typhoons were more common during cold periods such as the Little Ice Age and Dark Ages Cold Period. Climate alarmists have claimed that global warming increases typhoons such as Haiyan, but this paper and many others demonstrate extreme weather, typhoons, and cyclones are more common during cold periods. Cold periods are associated with larger temperature differentials between the equator and poles, and temperature differences drive extreme weather. A warmer climate is a more benign climate. The paper also demonstrates flooding was more common during the Little Ice Age and Dark Ages Cold Period, and that the frequency of El Ninos/La Ninas is currently near the mean over the past 2000 years. Abstract. In this study, we reconstructed the paleoenvironmental changes from a sediment archive of the floodplain lake in Ilan Plain of NE Taiwan on multi-decadal resolution for the last ca. 1900 years. On the basis of pollen and diatom records, we evaluated the record of past vegetation, floods, typhoons and agriculture activities of this area, which is sensitive to the hydrological conditions of the West Pacific. High sedimentation rates with low microfossil preservations reflected multiple flood events and humid climatic conditions during 100–1400 AD. A shortly interrupted dry phase can be found during 940–1010 AD. The driest phase corresponds to the Little Ice Age phase 1 (LIA1, 1400–1620 AD) with less disturbance by flood events, which enhanced the occurrence of wetlands (Cyperaceae) and diatom depositions. Humid phases with frequent typhoons are inferred by high percentages of Lagerstroemia and high ratios of planktonic/benthic diatoms, respectively, during 500–700 AD and Little Ice Age phase 2 (LIA2, 1630–1850 AD). The occurrences of cultivated Poaceae (Oryza) during 1250–1300 AD and the last ~400 years, reflect agriculture activities, which seems to implicate strongly with the environmental stability. Finally, we found flood events which dominated during the El Niño-like stage, but dry events as well as frequent typhoon events happened during the La Niña-like stage. After comparing our results with the reconstructed proxy for tropical hydrological conditions, we suggested that the local hydrology in coastal East Asia were strongly affected by the typhoon-triggered heavy rainfalls which were influenced by the variation of global temperature, expansion of the Pacific warm pool and intensification of ENSO events.